This week I have kept myself busy cooking. My child has been keeping me busy by fighting (or fully refusing) naps every single day this week; as a result, the last time I relaxed, even a little, was last Saturday. Octavian has been over-tired, emotional and clingy, while I’ve been over-tired, emotional and the complete opposite of clingy (poor husband, sorry I’m NOT sorry). Not to mention Octavian’s sudden need to wear FLEECE pjs all the time (it was 90 degrees today), or, if we’re out in public, insistence on stripping down naked. Don’t even get me started on the dog. I have kept myself sane by always having a busy kitchen. In fact, I’ve probably kept the kitchen a little too busy this week- 9 new recipes and 9 new sets of photos in 4 days (including cherry bars with fresh cherries and cherry BBQ chicken sandwiches topped with pickled red onion and coleslaw on buttery brioche buns). Now that I think about it, I have no idea how I’ve managed it all (and the laundry, and the dishes and showering). To be fair, I have help from my amazing mother-in-law every Tuesday and Thursday afternoon from 230pm until bedtime. Without her help, this blog and little (much needed) income it provides would not be possible. I can multitask, but I’m not that good, not even close. The days when I have to take photos with Octavian in my office are always an interesting song and dance trying to get the right shot, with the right light, with the right camera settings, without my child’s fingers all over the food or, worse, him playing with all my many very fragile food props. And now that we have the dog, madness. A while back I wanted to make my first even whole chicken. It always seems so intimidating; naturally, it seemed like the right time to challenge myself. You guys, don’t be intimidated. This may just be the easiest (yes, maybe messiest) chicken I have ever made. 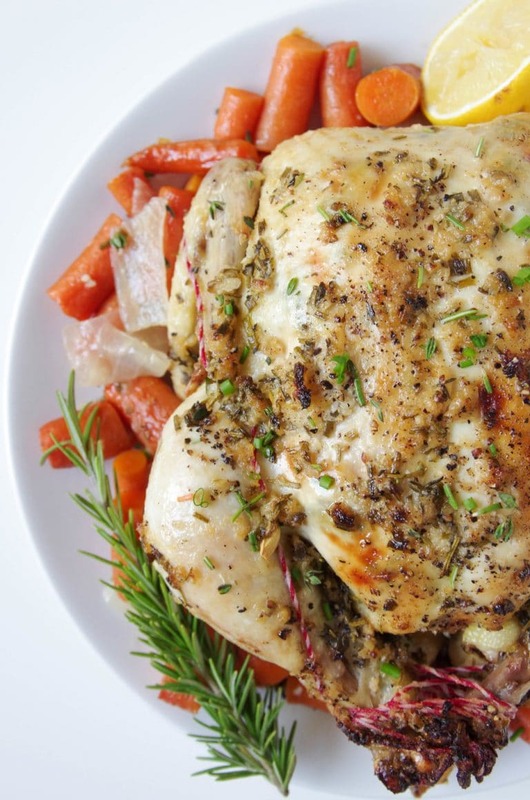 Buy a chicken, smear on some herbed butter and cook. EASY! 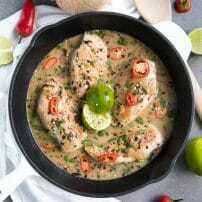 The result is a juicy, flavorful and very impressive chicken. Octavian ate the drumsticks and wings, the husband ate the thighs and I ate the breasts, more or less. In other words, it was a huge hit! Leftovers are perfect tossed in salads, pasta or a sandwich. 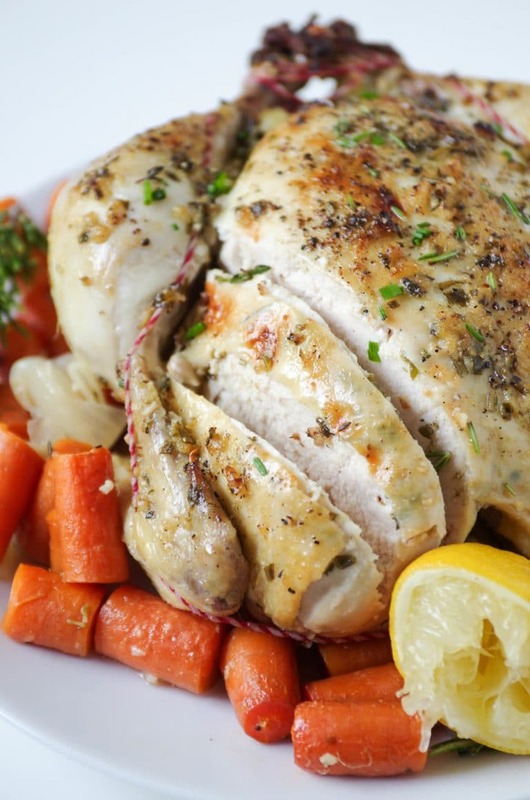 Remove chicken from the refrigerator and allow it to come to room temperature. Meanwhile, in a small bowl combine minced garlic, minced herbs, lemon and zest and melted butter. Whisk together with a fork. Thoroughly dry the chicken and season it with salt and pepper all over (don't be shy). 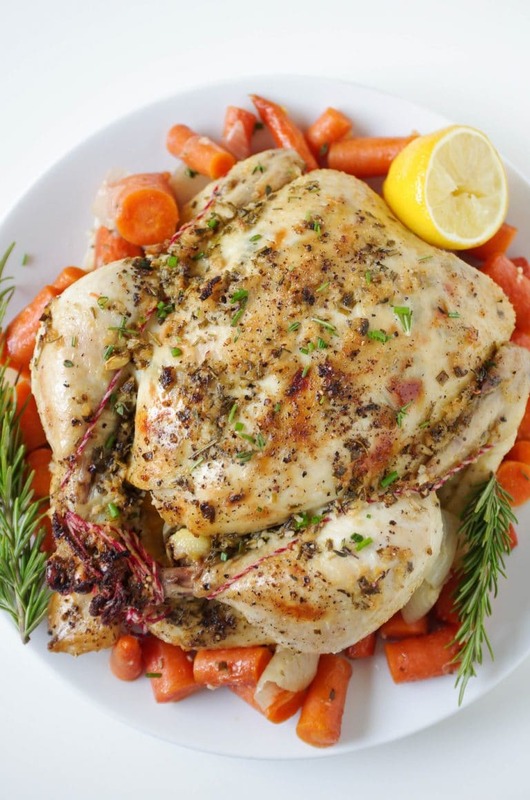 Using your hands (yes, it's messy) rub the garlic and herb butter all over the chicken. Gently separate the skin from the breast meat and rub some extra butter goodness under the skin. Continue this onto the thigh meat. Truss the chicken with cooking twine or tuck the wings under the chicken to cook. 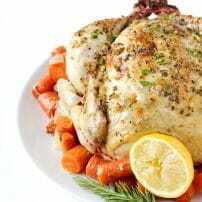 Place the chicken in a roaster or cast iron skillet or Dutch oven and roast, covered for 1 hour and uncovered for an additional 1 hour (or, if you are cooking a different size chicken, approximately 20 minutes per pound). Baste every 20 minutes or so with juices from the pan. 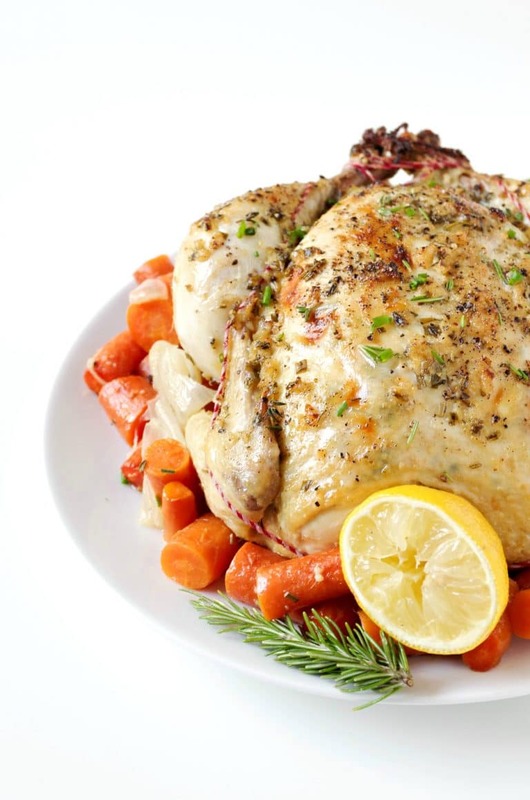 Your chicken will be finished when thigh meat temperature reads 170 degrees and breast meat temperature reads at least 165 degrees. Remove from oven and garnish with a squeeze of fresh lemon and a pinch of salt. Thanks for posting this! I’ve gotten in the habit of a faux-tisserie slow cooker chicken, which is great for busy weekdays, but I’ve been thinking I should up my game on Sundays. You make the herb butter sound crazy easy. Now I want to make some compound butters and stick them in my fridge!